Hot Tubs Now @ Willowbrook Cabins! Hiking and Hot Tubs in the Shawnee National Forest! 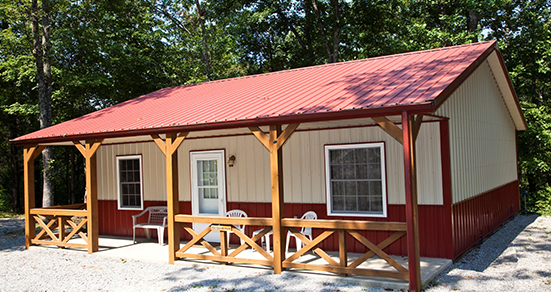 The Perfect Shawnee Forest Cabins are right here! 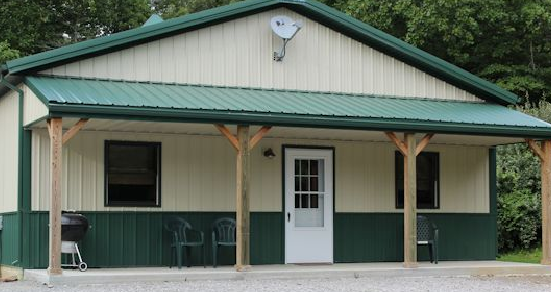 Willowbrook Cabins is the largest cabin rental company in Pope County just North of Golconda, IL in the middle of the best and largest part of the Shawnee National Forest. We are the closest Shawnee Forest Cabins to Millstone Bluff Petroglyphs, Burden Falls, Jackson Falls, Lusk Creek Canyon, Sand Cave, Bell Smith Springs and other great hiking trails. Our guest have repeatedly confirmed Willowbrook is the ideal homebase location for any Shawnee Forest adventure. Our cabins near Shawnee National Forest are within walking distance to the brand new Lusk Creek Kayaking launch! Willowbrook is located directly on the River to River Trail and just up the road from the largest Marina in Southern Illinois (Golconda Marina!). We are only a short drive away from the nationally recognized Garden of the Gods hike but closer to the hundreds of other Shawnee Forest attractions you will be exploring! Outdoorsman Cabin - 2 Bedrooms - Hot Tub! 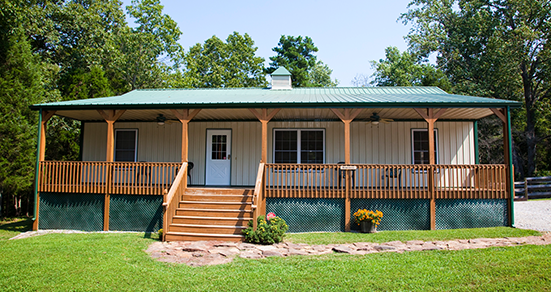 The Outdoorsman cabin is one of our most popular cabins as it offers 2 bedrooms, a full bathroom, kitchen, large living room with an open floor plan and a private hot tub on the back deck for a very reasonable rate. This cabin is ideal for young families, romantic getaways, hikers and even hunters visiting the Shawnee National Forest. This cabin has the ability to sleep up to 6 guests comfortably. Large Cabins - Bring the Entire Family! The Bunkhouse cabin is perfect for large groups that need more space such as family reunions, hiking clubs, or even big families wanting more room! This cabin offers 3 bedrooms, 2 bathrooms, big kitchen with a large open floor plan and huge front and back decks. Plenty of room for the whole family to spread out! Up to 9 people can sleep in the Bunkhouse cabin. Hiker Cabin - 2 Bedrooms - Hot Tub! If you like camp fires and hot tubs, the Hiker cabin is perfect. This cabin seems to be very popular with couples and families alike. 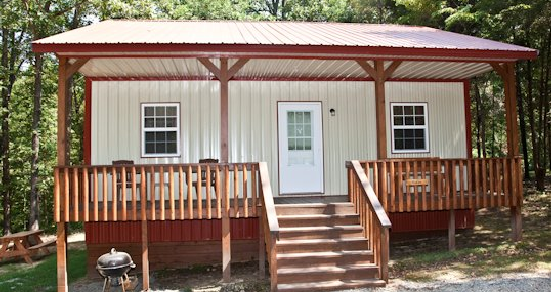 The Hiker cabin offers 2 bedrooms, 1 bath, full kitchen, large open living room and private hot tub on the back patio. This cabin has one of the largest fire pits too! The Hiker cabin is able to accommodate up to 6 people. $99 - Great Value Cabin - 2 Bedroom! This is one of the best value cabins in the entire Shawnee National Forest. The Angler cabin is super popular with guest looking to explore on a budget but not sacrifice on amenities. This cabin has 2 bedrooms, 1 bath, full kitchen and a large living room. It has a washer & dryer, free Wi-Fi, DIRECTV, fire pit and free firewood. This cabin can sleep up to 6 people. Established Cabin Business - 10th year! Centrally located near top Shawnee National Forest hiking trails! In Pope County - 93,000+ acres of public land - 1/3 of the Shawnee Forest! Super Fast Free Fiber Optic WiFi in Each Cabin! Want to share your Shawnee National Forest Adventure with family and friends? Maybe update your Facebook Status? Free WiFi internet access at Willowbrook makes it easy to stay connected. Copyright 2018 Willowbrook Cabins LLC.